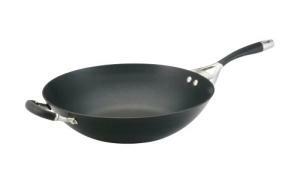 Stir-fry pans are similar in shape to a salad bowl allowing for easy tossing of vegetables. For example, Circulon's 14-inch Stir-Fry pan has rounded, sloped sides which make it possible to quickly rotate or stir vegetables or other stir fry ingredients while they cook. This way of cooking is the proper technique for stir frying foods. In addition to its shape, Ciculon's exclusive total food-release system with its nonstick interior and exterior makes it easy to stir fry foods, especially things like tofu or meats that are prone to sticking. The professional-quality pan heats up quickly and evenly so there are no hot spots where foods could burn. The riveted 18/10 stainless-steel handle with silicone Comfort Grip insert makes handling the pan easy. No need to grab a pot-holder for all that stirring. Washing by hand is recommended, but the non-stick surface should make that a breeze. The pan also comes with a limited life-time warranty. All in all a good deal for a pan that will cost you less than taking your family out for dinner at your local Chinese restaurant. Plus, this way you control the amount of oil going into the pan, what types of vegetables/meat to include, and where those vegetables/meats come from. The only thing missing is the fortune cookie.